Below are 8 worthy letter extracts of Maharaj Sawan Singh Ji for Mind’s training. In the beginning, one has to fight the mind and overcome the uneasiness and persist in holding the center. By doing so, the mind gives up its restlessness and becomes calm. You should increase your time for meditation. It should be for not less than two and half hours at a stretch, whether the mind takes interest in meditation or not. Sometimes, the mind avoids it on petty excuses. When it behaves like this, it should be punished by increasing the time day by another half hour. The longer your meditation, the greater will be your control of the mind. Then you will begin to derive pleasure from meditation and the inner path will be opened to you. There should be no break in your daily meditation. If you are going fox hunting, go with the preparation of lion hunter. The same applies to mind hunting. Every day one should be on the job with renewed determination. When you sit in meditation, you should enter into an agreement with your mind considering it as an entity different from you that it should not bother you for a period of two and half hours. You can tell it that if it misbehaves, you will sit for even more than two and half hours for as long as it does not feel the ecstasy of eternal bliss. This is how the human mind is to be controlled. Please see that at the time of Simran and bhajan the mind stops its running. Tell your mind not to secret thoughts at this time, and if it does, throw it out immediately. The secret of success lies in making the mind motionless. Twelve hours sitting in meditation with the mind wandering is not so useful as one hour sitting with the mind motionless. One round from a rifle held and fired properly will hit the target, and any numbers of rounds fired improperly will go off the mark. Do not listen to the mind — always try to bring it under the rule of the Master. Be on guard against its deceits. The more you look after it, the more you will go to (within) the internal practice. So long as the mind has not developed the capacity to throw away at will the impressions of this world, it cannot sit inside, disconnected from this world. But it has the capacity to do so and it has to be trained. It is a slow affair — it requires patience, perseverance, and faith. Do not lose heart but fight courageously. The battle has just begun. The mind is not stronger than the sound current. The Master is with you. He is watching your every movement. He is prepared to fight your battles with you. Take him as your helper — have faith in him. Fight the mind and you will succeed. After you proceed with your meditation, you will feel peace and bliss, but it should be a lasting and not a momentary feeling. This will come when you have practiced and devoted considerable time to the Sound Current. Sanskars, i.e., impressions of past lives, enable some people to hear the Sound easily, but to hear alone is not enough. You must be one with it, Your love for the Master and the repetition of the Holy Names enables you to do this. There is power, happiness and bliss in Nam also called the Word, Shabad or the Sound. And the real form of the Master is also Shabad. It is That which we all seek. The service which we value and appreciate most is that which helps the disciple, and this is ‘Surat-Shabd’ service or devotion to the Sound Current. It is good to be helpful to others, but to be able to render proper and effective help to others in their spiritual uplift, one must first of all be in a position to do so, i.e, he should have worked his way up sufficiently for this purpose. Nothing should stand in the way of your meditation, and no disciple should plunge so deep into worldly affairs as to enable them to interfere his Bhajan or affect his mental poise. This body of ours is the epitome of the universe, a microcosm that holds the macrocosm within it. Hindu sages have called it ‘Nar Narayani Deha’, the body that holds man and God within it. Sikh Gurus have named it ‘Har Mandir’, God’s temple. Guru Nanak says: The body is the real Temple of God. Christ refers to it as The Temple of Living God and says: The kingdom of God is within you. In fact, all the Saints and Sages who have made research in the realms of soul and matter have come to the conclusion that our body contains everything, namely, all that we see in this world of phenomena as well as that which remains hidden in the world beyond. They also claim that God can be realized only within the body, and if anyone desires to visit the subtle, astral and spiritual regions, he must search within himself. The Supreme Artist’s real handiwork can only be seen within. Whatever exists outside is false. The reality of the body and of the entire macrocosm can be seen clearly and distinctly nowhere else except within ourselves. Those who seek outside are in delusion. Now let us make some research in the secret chambers of this house, about which Jesus Christ says: In my Father’s house are many mansions. Hindu Sages refer to this body of ours as a ‘house with nine doors’. Sometimes it is referred to as ‘a house of ten gates’. Nine gates open outward, through which our energies are dissipated. The tenth gate opens the Way to the Palace of the Lord within. The nine doors comprise our two eyes, two ears, two nostrils, the mouth and the two lower outlets. The tenth is in the center behind the two eyes. It is called Tisra Til or Tesoro Til, Shiv Netra or Third Eye. The Muslim Saints call it Nukta-i-Swaida. A study of the inner structure of this house will reveal that it contains twelve stories, which can be divided into two parts. The part below eyes is called ‘Pinda’. 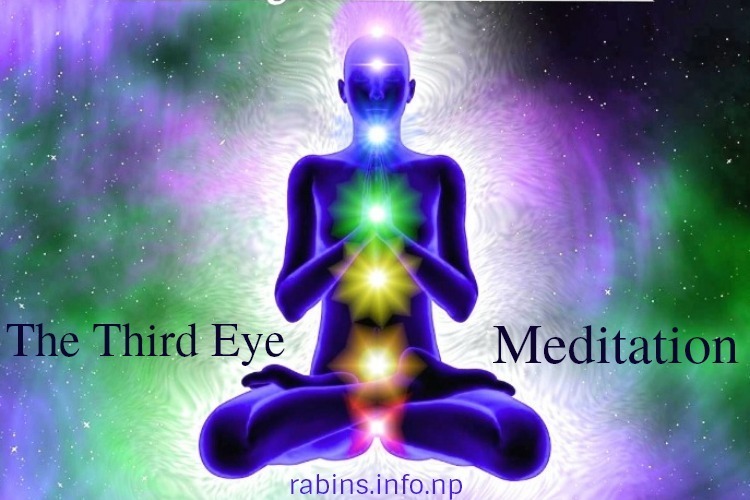 It contains six chakras and extends up to the eyes. Above the eyes, we have ‘Anda’ and ‘Brahmanda’ as well as the higher regions, which make up the second part. Yogis enter the body through/from the lowest chakra called the Muladhara and stop at the eye center. which they consider the last and the highest region. The Saints teach us to start from the eye center which is the headquarters of the mind and the soul in the waking state. The Saints show us how to rise from this point up to Sat Lok, the fifth region above the eyes. They save their disciples the drudgery of going down and then treading the tedious, long, dreary and perilous of the Khat Chakras, Kanwals, Centres or Plexuses.